The NxSensor cloud-based analysis platform brings many opportunities to improve PV O&M activities and achieve better energy yields. The probability distribution chart is a tool to statistically analyze the occurrence of data events. Each point in the chart is a count of the number of times the measured data sample is found to be within a corresponding range of the amplitude (“a bin”) . 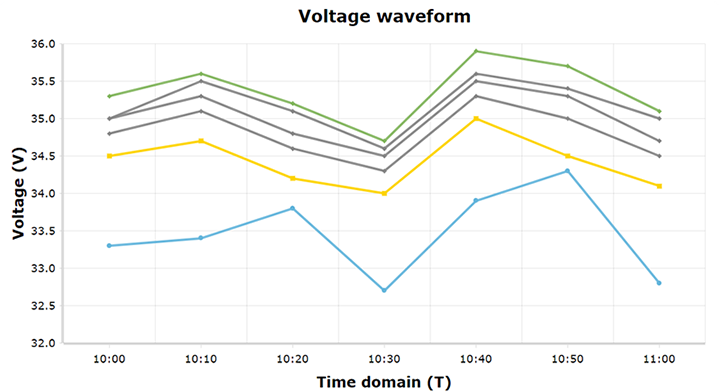 Considering that all PV modules under the same environment should have similar performances ideally, so that the voltage data of PV modules has a tendency to remain near their mean value. During one observation period, if a PV module always has large performance variations against others, the cloud will see it as a abnormal one. Depending on the performance, the cloud classifies the module statuses into several levels such as normal, warning, fault, and so on. 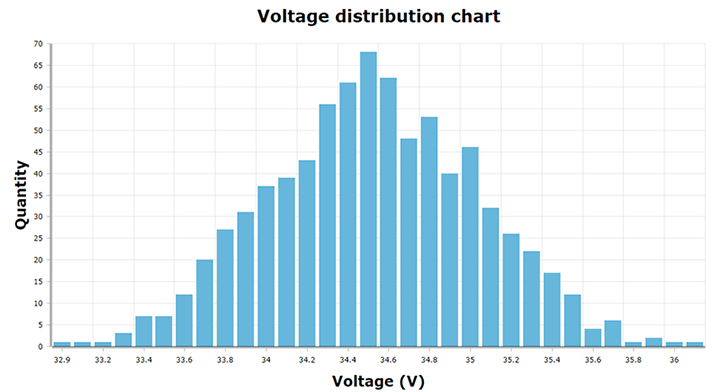 On the other hand, the cloud analyzes the voltage waveform from the time domain to see the historical data changing and look for instability or inconsistency of the PV modules, which can be useful in detecting issues. The above analysis can used be applied to the temperature or current data. NxSensor teams are also working hard to extract features of typical PV module faults, such as partial shadowing, blown by pass diodes, error electrical connection, glass breakage, PIDs and so on, to help O&M companies to better understand PV module behaviors and find root cause of faults. The cloud stores PV modules' electrical connection information and their physical layout information. When a fault is detected, the UI could precisely localize the fault source and inform O&M teams where it is. The UI uses colored blocks to indicate different statuses of a PV module. Monitoring demo of a live solar power plant.